FEDERAL Member for Lyons, Brian Mitchell MP, has highlighted the value of getting a flu vaccination through your local community pharmacy by getting his shot this year at Brighton Pharmacy. Mr Mitchell said receiving his flu shot at a local community pharmacy highlighted the value of the service. We’re not sure whether Brian Mitchell received a jelly bean for being brave, but he’s still smiling. 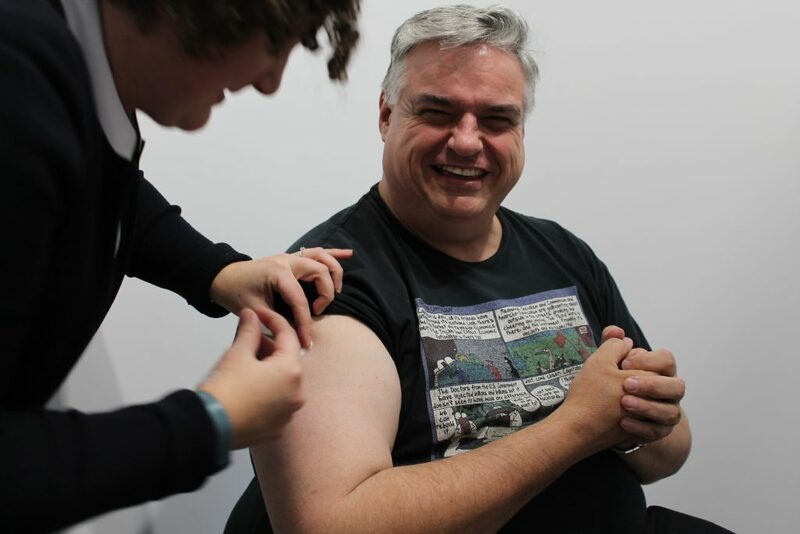 “This demonstrates how much easier it is for anyone to get their flu shot with trained community pharmacists able to directly administer the flu vaccine,” Mr Mitchell said. Mr Mitchell said the availability of flu shots through community pharmacies was important for communities throughout his electorate. “The availability of vaccination by pharmacists greatly assists the community’s access to protection against the flu where previously they may have not had accessibility or access was difficult and cumbersome,” he said. Proprietor of Brighton Pharmacy, Rohan Targett, said having pharmacists deliver vaccinations was a huge benefit for consumers. “In the short time that community pharmacists have been allowed to administer the vaccine there has been a high percentage of people being vaccinated for the first time,” he said. Mr Mitchell said that consumers could be confident about getting their flu shots in a pharmacy as pharmacists giving the shot had to undergo special training.